Kathleen Dragan first came to Chicago nine years ago and instantly fell in love with it. A year later, she moved to the South Loop with her husband, where they still live with their 6-year old son and daughter who turns 9 next month. 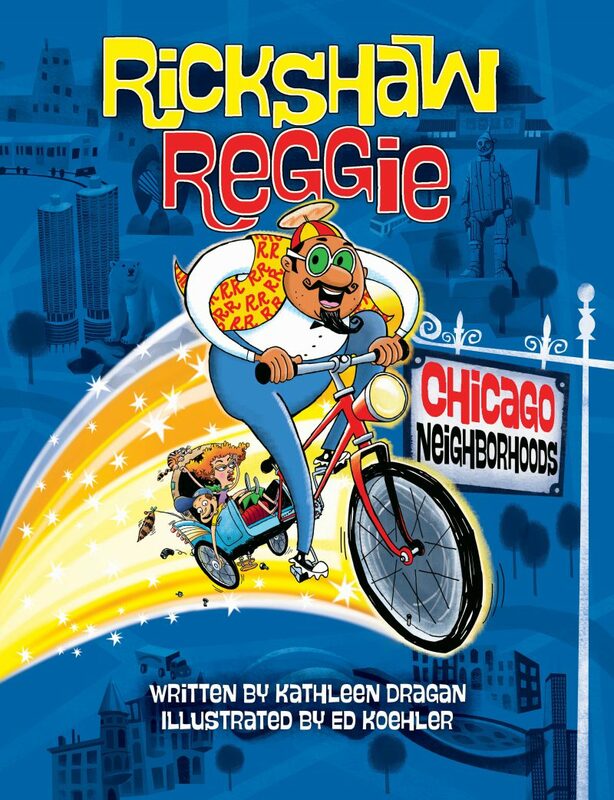 A former Spanish and French teacher, Dragan has written a children’s book to introduce kids to the different neighborhoods in Chicago through a character named Rickshaw Reggie. The book, “Rickshaw Reggie: Chicago Neighborhoods” is written by Dragan and illustrated by Ed Koehler and published by Reedy Press. It’s about a kid named Charlie who thinks he knows everything about Chicago: deep-dish pizza, baseball, and tall buildings. Then he meets Rickshaw Reggie who takes him on a magical tour of Chicago’s many neighborhoods, he learns the real city begins at the edge of his imagination. From Lincoln Park to Hyde Park, from the Indian Boundary Line to the Pullman cars, Rickshaw Reggie shows Charlie and his grandma the who, what, where, and when of the real Windy City. Bob Chiarito of the Chicago Ambassador recently chatted with Dragan about how she decided what neighborhoods to include and how the book came about. CA) I love the fact that the neighborhoods you picked (aside from Lincoln Park) are not the traditional, well known neighborhoods that are known by outsiders. Portage Park, for instance. It seems that this is a good book for kids who live in Chicago as well as for kids outside of Chicago. DRAGAN) I like to think so. CA) A lot of Chicago kids tend to be stuck in their neighborhoods. This seems like a chance for them to learn about other neighborhoods. Maybe they will read your book and then want to go there? DRAGAN) That’s exactly what I was going for. I’m so glad that you got that from the book because that was my aim. That was probably the hardest part, choosing the neighborhoods. The guiding factor for me was that I wanted any child, anywhere in Chicago to be able to pick up that book and find something that was familiar to him or her. Whether you lived on the North Side or the far South Side, they would see something and say ‘Oh right, we’ve driven through there’ or ‘My train stopped there.’ And I want kids and their parents to want to go check out Pullman, for example. I have friends who live in Chicago and have taken their kids to Europe, but have never taken them to Pullman, which is a National Park. So, it’s twofold. I want people to see the familiar and to see the unfamiliar and peak their curiosity. CA) How did you decide what to include from those neighborhoods? Were they just favorites of yours? DRAGAN) I always started by doing research. I read a lot about the neighborhoods and read a lot of the Arcadia Publishing books on a lot them, as well as online blogs, the Choose Chicago website and if I knew anyone in those neighborhoods I asked for their input. Then I spent time wandering around in those neighborhoods and talked to people. CA) Did you need permission to use the logos/images of certain places like Janson’s Drive-In on the South Side or the Patio Theater in Portage Park? DRAGAN) It’s for editorial use so I didn’t technically, but I always talked to the owners and told them what I was doing and everyone was excited about it. CA) Were there any who tried to influence you – it wasn’t a situation where they paid to be included like an advertiser? DRAGAN) Not at all. No one paid to be in. I didn’t even get anything comped. I wish, because I ate in every single restaurant that’s in the book. Every single one, because I wouldn’t have felt right telling people about the places and not eating there. But, as a result, I put on quite a bit of weight. (Laughter). CA) How did you come up with the character of Rickshaw Reggie? Then after I wrote it I met some actual rickshaw drivers and that was a really fun experience because they are like this subculture and really fun to know. I started describing Rickshaw Reggie to them and they would be like ‘That’s Dan, that’s Dan!’ So apparently I was writing about a guy named Dan who I hadn’t met yet. CA) Where does Dan drive his Rickshaw? DRAGAN) I think he starts at the Willis Tower, which is where a lot of them start. It’s funny that most do not go to the neighborhoods that are in the book because they are too far. CA) How long of a process was putting together the book? DRAGAN) From conception to book in hand it was about 15 months, which is not terribly long. My portion was about 6 months in terms of researching and writing, but then you had the art. Ed Koehler is a fantastic illustrator and a fan of Chicago. I talked to him a lot and he ended up taking it and running with it. CA) Did you know him before? DRAGAN) No, he was hired by the publisher but we did get to meet in person and that was really helpful. I was really happy to work with him. CA) This appears to have potential for more cities. Would you consider doing “Rickshaw Reggie goes to Milwaukee” or “Rickshaw Reggie goes to San Diego”? DRAGAN) Definitely. Reedy Press, their niche is that they always have local authors. There’s like 9 of us in Chicago who have written books about Chicago and they like that sort of branding, having a local author, but I would love it if Rickshaw Reggie went to some other cities and I’d help the author in any way that I could. CA) How does that work, do they own Rickshaw Reggie? DRAGAN) I think they own him, and they definitely own the art. I’d love to be a part of future projects if they ask me to. I was thinking of ‘Duckboat Danny’ if we did a Boston based book. Maybe he’s a friend to Rickshaw Reggie. It’s fun to dream, we’ll see. It’s all so new. DRAGAN) It’s crazy, a few weeks ago their warehouse had a 5-alarm fire and they lost 200,000 books. It’s terrible. The good thing is that no one was killed. They will rebuild and the books will be reprinted. CA) Is there a target age group for the book? DRAGAN) I always say from 5 to 8 because of the reading level. However, there are fans of the book from 2 to 92. If you like the book, then the book is for you. CA) You probably get this question a lot, what’s your favorite place to visit in Chicago? DRAGAN) I do. I probably spend the most time in Pilsen, of the neighborhoods in the book. I also really love to explore and I know there are still areas that I haven’t seen. I only count going to a neighborhood if I’ve done something there. I don’t count it if I’ve only driven through it. Of the 77 neighborhoods, I’ve done something in 38 of them. I’d love to get to 77. To find out more and/or to order Rickshaw Reggie: Chicago Neighborhoods, click here.